Google's Pixel 3 smartphones are probably one of the worst kept secrets in the entirety of tech history. The phones leaked in their entirety in weeks leading up to launch, and one retailer in Hong Kong even started selling the Pixel 3 XL ahead of time. If you were hoping for Google to still have a surprise waiting in the wings, you're probably disappointed. The leaks have pretty much been spot-on, and the official launch of the Pixel 3 and Pixel 3 XL didn't really add a lot that we didn't already know. Still, that doesn't mean that Google doesn't still have a couple of nifty software tricks up its sleeve. Furthermore, there are things that only become apparent when you hold the phone in your hands, such as its build quality and display (Google sure has a lot to fix on this point coming from the Pixel 2 XL). The good news is that while the phones may lack design flair, they make up for that with pure substance. I'm probably not alone in thinking that the Pixel phones are starting to look a little dated in an era of razor-thin bezels. The Pixel 3 and Pixel 3 XL are probably best described as functional, which is to say that they're useful, above all else. That said, I'm happy to report that the Pixel 3 phones feel more premium than the Pixel 2. I'm not a fan of all-glass backs, but now that Qi wireless charging has arrived on the Pixel 3, Google has finally ditched the metal body of the Pixel 2. However, instead of a single pane of glass that's slick and shiny from top to bottom, Google has somehow sanded the bottom three-quarters or so of the back to produce a lovely matte finish. I dislike glass backs mainly because of how reflective they are and how easily they attract fingerprints, but Google's approach seems to have addressed these concerns. The matte surface also comes close to approximating the feel of metal, which is quite welcome. 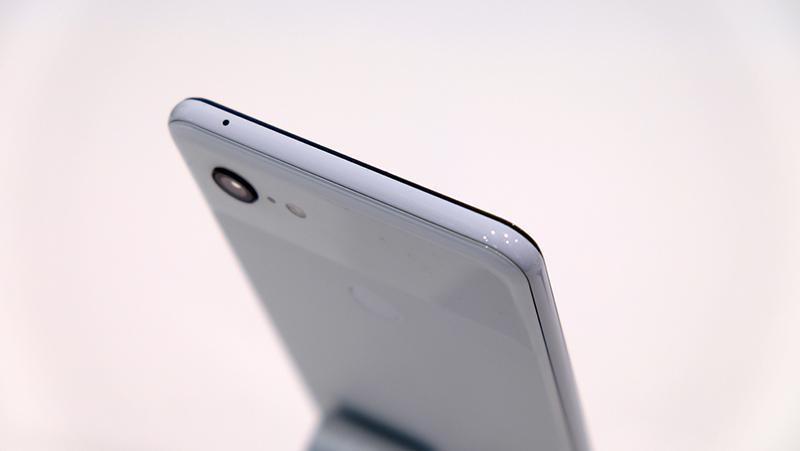 In another nice touch, the aluminum frame in both the Pixel 3 and Pixel 3 XL feature a shiny coating that blends in nicely with the Gorilla Glass 5 panels on the front and back of the phone. I'm reminded vaguely of the shiny frame surrounding the new iPhone XS, and while Google's approach isn't quite as eye-catching, it is an improvement over the dull aluminum frame on the Pixel 2. 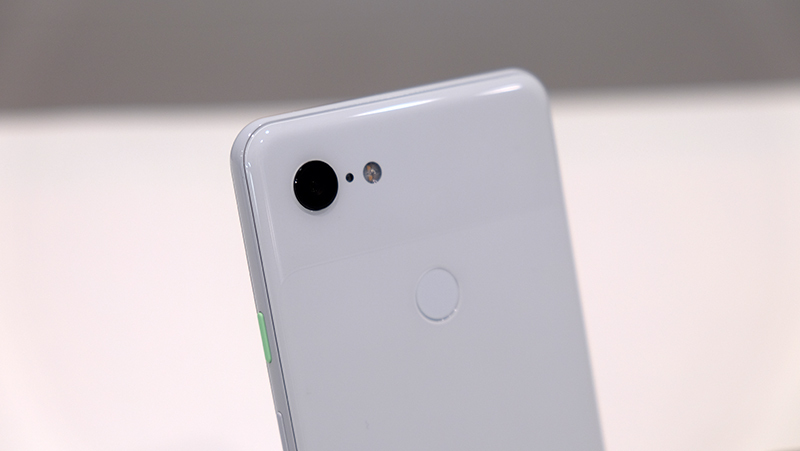 Elsewhere, the contrasting power button is making a return on the Pixel 3, and the Clearly White and Not Pink colors come with mint and orange buttons respectively. 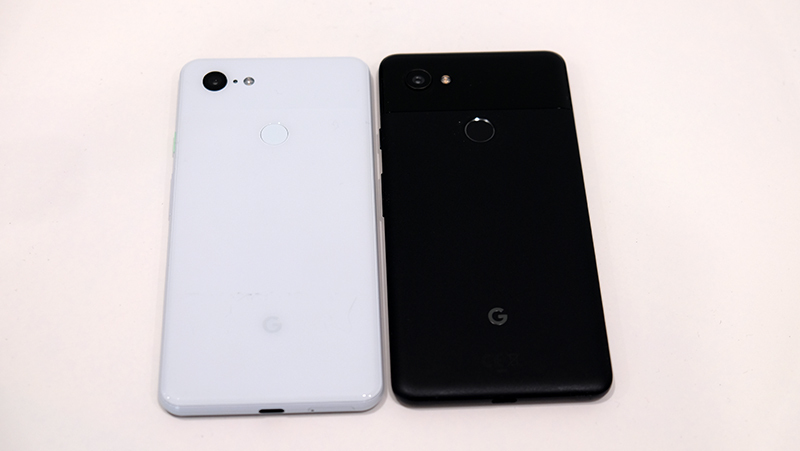 But these small differences aside, you've probably already noticed how much the Pixel 3 looks like the Pixel 2. 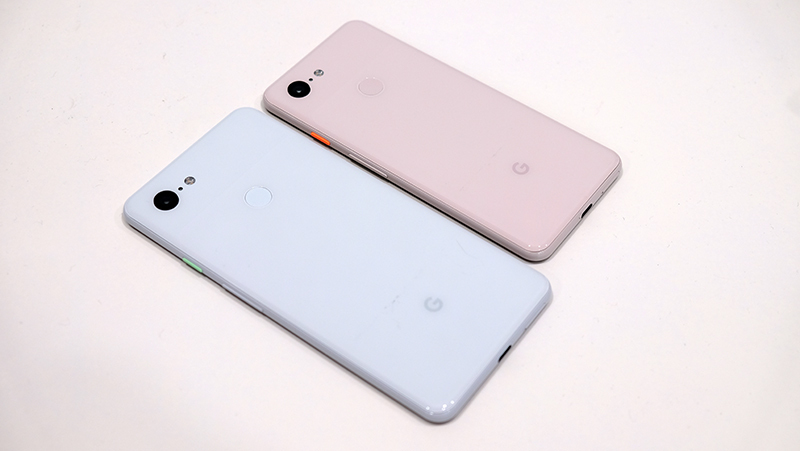 Save for the new Clearly White and Not Pink colors that the Pixel 3 now comes in, the backs of the Pixel 2 XL and Pixel 3 XL are nearly indistinguishable. 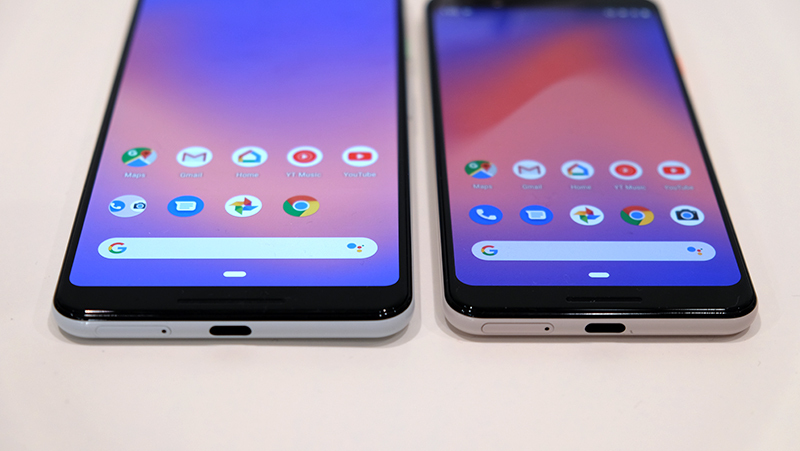 The biggest difference is obviously at the front, where the Pixel 3 XL sports a hilariously tall notch. 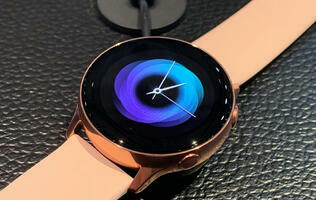 But having seen the notch in person, it's actually less of a big deal than the outcry over it would suggest. It isn't that obtrusive, and I appreciate that it's allowed Google to push the display closer to the top of the phone. Of course, it does eat into the display in a way that isn't super slick or elegant, but it didn't really bother me in a big way. 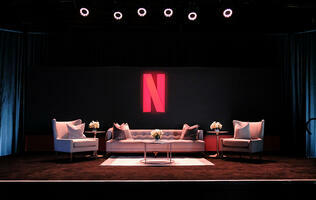 Another important point to address is the display. Is the blue shift gone? Yes, yes it is. 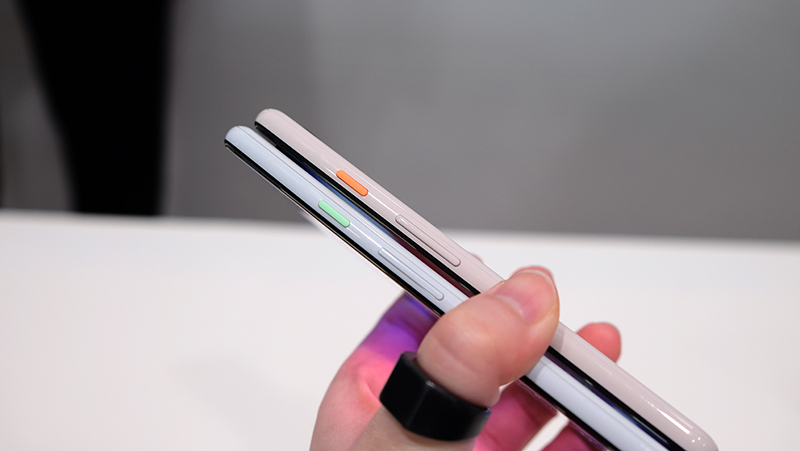 Both the 5.5-inch Pixel 3 and the 6.3-inch Pixel 3 XL now use flexible OLED panels that Google says were designed from the ground up for the Pixel. They also come calibrated out of the box in a new Adaptive mode, which is supposedly more vivid while not reaching Samsung levels of retina-searing contrast. In addition, the displays also come with HDR certification. I'll have to spend more time with the phones before I say more, but at first glance the displays look pretty good. As before, the Pixel 3 is basically a smaller version of the Pixel 3 XL. They are both powered by a Snapdragon 845 processor, 4GB of RAM, and either 64GB or 128GB of storage. The smaller Pixel 3 also comes with a smaller 2,915mAh battery, compared to the Pixel 3 XL's 3,430mAh battery. The 4GB of RAM looks pretty underwhelming when set beside flagships that have anywhere from 6GB to 8GB of RAM, but Google insisted that it had put careful thought into configuring the hardware for the phone, and 4GB was sufficient for good performance. For instance, the Pixel Visual Core at the heart of the camera has its own memory, which alleviates the burden on system memory somewhat. In addition, the 5.5-inch Pixel 3 is shaping up to be a more attractive option than last year's 5-inch Pixel 2 (when compared to their respective XL variants). 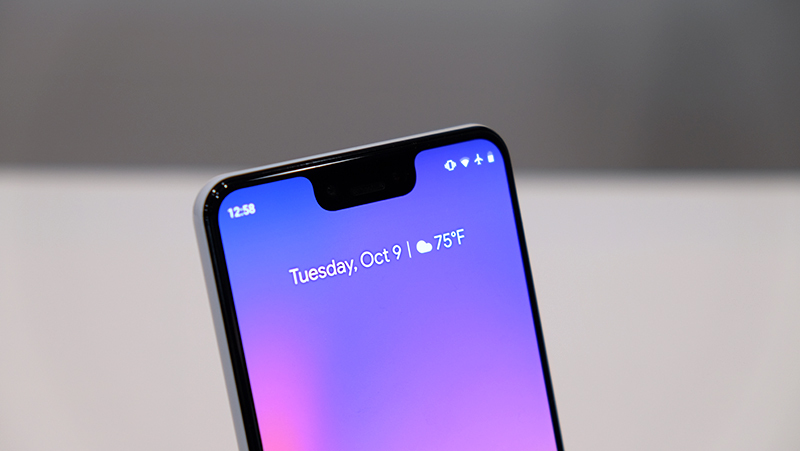 The Pixel 3 now sports a higher resolution 2,160 x 1,080-pixel OLED display, compared to the Pixel 2's 1,920 x 1,080-pixel resolution. 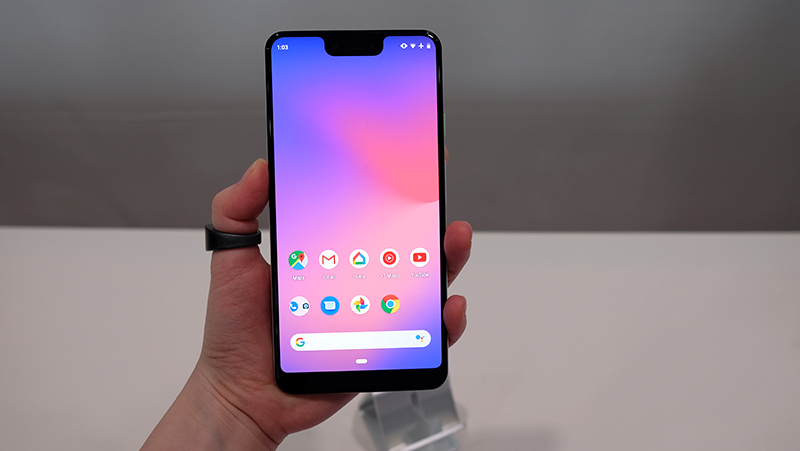 On top of that, the bezels have been slimmed down, and it basically looks like a Pixel 2 XL from the front. 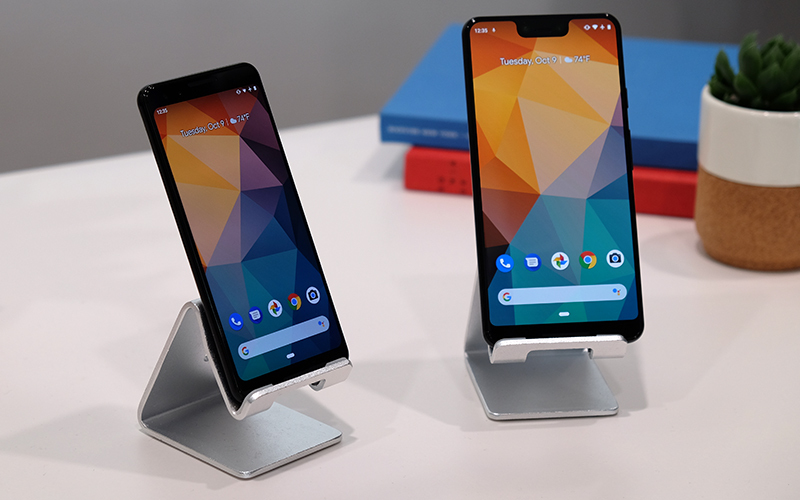 When it comes to the Pixel 3 XL, Google has managed to cram a larger 6.3-inch display into a similar-sized chassis. The display resolution has also been bumped up slightly to 2,960 x 1,440 pixels. 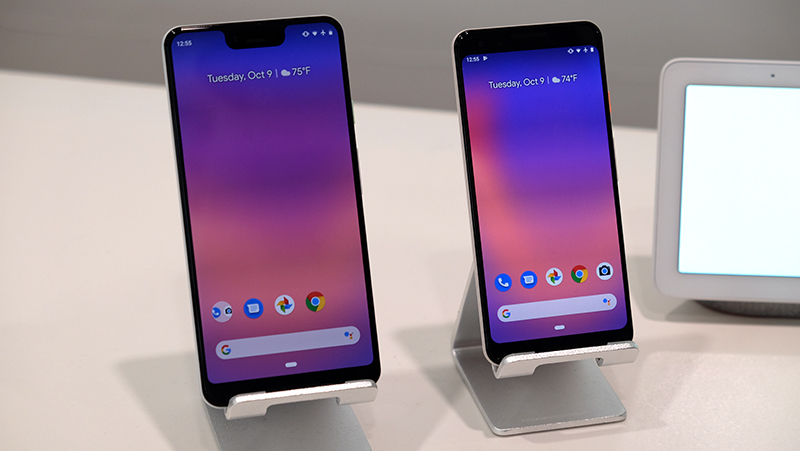 If you're not a fan of the current crop of jumbo-sized phones, the Pixel 3 is obviously a lot easier to handle and deal with, and comes with fewer shortcomings than last year's model. Finally, the 3.5mm headphone jack looks to be gone for good. At the bottom, the phones have the same USB-C port and SIM card slot. Unfortunately, there's no support for dual-SIM capabilities. The Pixel 3 will ship with a pair of wired USB-C earbuds modeled after the Pixel Buds, complete with Google Assistant baked in. Google also announced that its real-time translation features would be coming to all Assistant-enabled headphones, so you'll be getting that as well. But the most exciting part of every Pixel phone is probably going to be the camera. With such a stellar track record, expectations for the Pixel's camera are always going to be high. Google is still stubbornly sticking to just a single rear camera this time around. It's argument is that its computational photography smarts can more than adequately mimic the features added by an additional telephoto lens, such as a natural bokeh effect, so there's no need for a second camera. But while the 12.2MP dual-pixel rear camera and its f/1.8 aperture don't seem like much to get excited about on paper, Google's strength has always been the software features baked into the camera. Google is introducing a bunch of new additions this year. First off is something called Top Shot, which takes a series of pictures before and after you hit the shutter button. Alternate shots are also captured in HDR+. Google then applies its AI smarts to pick the best shot, automatically filtering photos where the subject may have a strange expression or have their eyes closed. Then there's Super Res Zoom, which basically helps mitigate the limitations of digital zoom. The camera takes a burst of photos and then combines these images together to recreate detail and produce a less grainy photo. In effect, it leverages small differences in each photo and merges them to produce a higher resolution picture with more detail. Finally, Night Sight uses machine learning to fill in detail and correct for color so you get a less noisy picture. We'll have to test it out for ourselves before giving a verdict, but given Google's record, I'm pretty optimistic. However, while Google is going with just one rear camera, it's opted for a dual front camera setup this time round. The new addition is a wide-angle camera that can capture a 97-degree field of view, which means it's better for group selfies (I refuse to use the term wefie). There's also a new Photobooth mode that can snap the selfie shutter when it detects your smile, which sounds pretty useful, if it works as advertised. Google is introducing something called Motion Auto Focus as well, which is exactly what it sounds like. It'll automatically follow a moving subject around the frame, so you don't have to keep tapping to focus. That's not all though, and I've saved the coolest feature for the last. Call Screen effectively saves you from having to talk to pesky cold callers. When you get a call, you can simply tap the screen button and hand the call over to an automated AI voice. 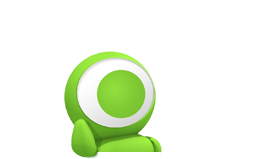 However, the phone will transcribe what the other party says in real-time on your screen. I was able to see this feature in action, and it sure looked like it was working well. 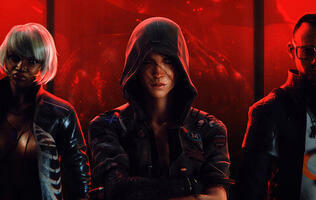 You can also select from a row of responses, and the AI voice will read them out to the caller. The Google Pixel 3 starts at S$1,249 for the 64GB version and S$1,399 for the 128GB model. The Pixel 3 XL is going for S$1,399 and S$1,549 for the 64GB and 128GB models respectively. Pre-orders open today but retail availability isn't till 1 November. 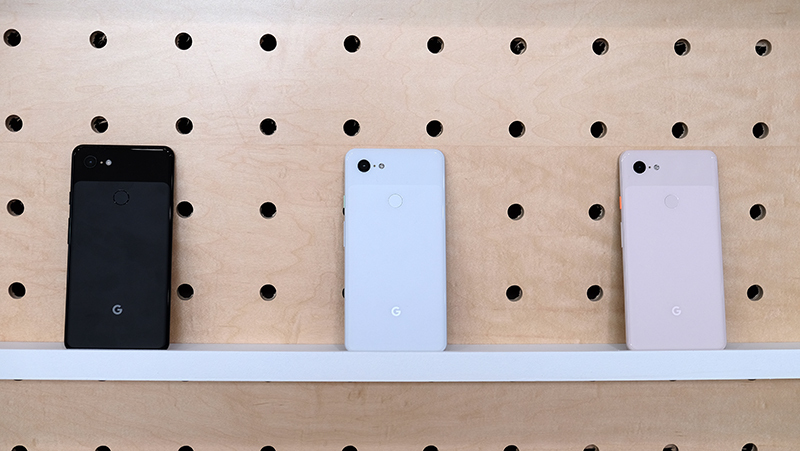 Read next: You can now pre-order the Google Pixel 3 and 3 XL.